SCM19's quasi-anechoic frequency response, (down to about 300Hz), clearly shows that we are dealing with a well-balanced loudspeaker in the middle and high-frequency range, with a sensitivity variance not exceeding, in any case, the ±3dB, interval, mainly set by a single peak around 11kHz which is typical of the tweeter, judging from the corresponding measurement in the SCM40 review. Apart from this, the loudspeaker response remains in a ±2.5dB or more narrow interval, especially in the midrange. The measurement also confirmed our impression (based on the SCM40 review) that the protective grill designed by ATC for the Hi-Fi series, although a bit "industrial" in appearance, is, in fact, the best we have measured so far, with an almost negligible contribution to the final result. Summed response, as a result of splicing the woofer nearfield and the quasi-anechoic measurements, confirmed our initial estimates: The SCM19 is -overall- a well-balanced loudspeaker with quite small sensitivity variation, not exceeding the ±2.4dBs in its pass band (mind that there are some differences between the two response curves since the summed response is presented with a 1/3 oct. smoothing). 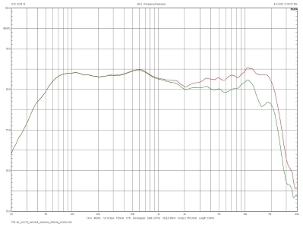 Average sensitivity (considering measurements in octave steps between 125Hz up to 16kHz) is close to 83dBSPL/2.83V/1m, a performance that undoubtedly classifies the SCM19 as a low-sensitivity loudspeaker, something quite expected given its architecture. Based on this figure, SCM19's bandwidth ranges between 40Hz and 23.2kHz (using the standard -6dB cut-off points) and between 52Hz and 21.6kHz for the standard -3dB cut-off points, a performance very close to that published by ATC themselves. Worth mentioning features of the summed response, are a slight gain, around 1.2dB in the 110Hz region and a quite wide in range (1kHz-6.4kHz) but rather "shallow" in level (no more than -2.4dBs) reduction of the sensitivity approximately centered at the crossover frequency. The comparison between the on axis summed response ant the one calculated as the average "listening window" response (series of measurements between ±10° both across the horizontal and the vertical axes) shows a loudspeaker with a smooth behavior, which gradually "softens" with frequency, above about 2kHz. Quasi-anechoic frequency response (dBSPL/2.83V/m) above 300Hz, measurement at 2m distance, with and without the protective grill (red and green curves respectively). 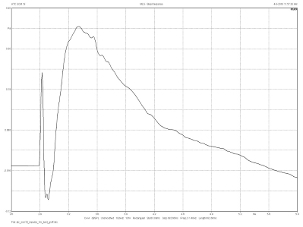 Summed frequency response (dBSPL/2.83V/m), far field/near field splicing, with 0.33oct smoothing. 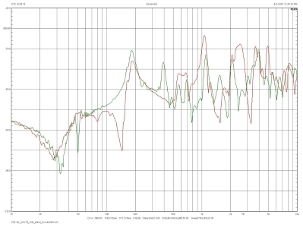 On-axis (red curve) and averaged on/off axis response (green curve). SCM19's impedance magnitude variation is quite small for frequencies above 100Hz and as an amplifier load is -for all purposes- constant. The minimum value of about 5.6 Ohm appears near 150Hz and allows us to conventionally consider the loudspeaker as an 8-Ohm load, although -typically speaking- a correct designation would be 6 Ohms. Below 100Hz, impedance magnitude significantly increases up to 50 Ohm, a behavior which could affect amplifiers with low damping factors. Also, phase behavior, ranging from +47° to -57° could be quite punishing for small amps. The good news, however, is that the minimum impedance magnitude value coincides with a small phase shift (13°), therefore driving conditions are not particularly adverse. Step response is very smooth and although the loudspeaker is not time-aligned, the transition area between the mid/woofer and the tweeter is particularly progressive and the low frequency damping very good, without significant findings. 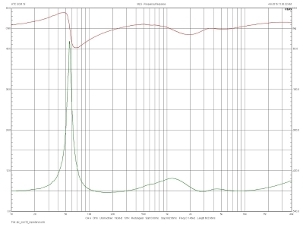 Impedance magnitude and phase (green and red curve, respectively). 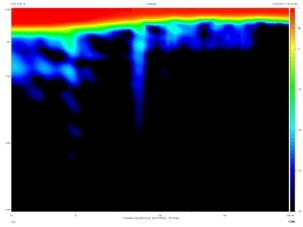 The feeling that we are dealing with a system with low coloration is confirmed by the cumulative spectra decay graph. The main finding here appears to be a resonance around 3kHz (3mS for an -25dBr attenuation). A more distinct resonance appears at 3.9kHz but with a faster attenuation, (2.6mS), and the same apply for a resonance in a slightly higher frequency (5.3kHz, 1.7mS). Towards the very high-frequency part of the audio spectrum, the loudspeaker is fast, with no visible resonance problems. The horizontal polar response shows that the SCM19 behavior in the horizontal plane is quite smooth in the region of middle and high frequencies and the loudspeaker maintains an exemplary homogeneity within the limit of 3dBs until up to at least 8kHz, for ±35° angles. 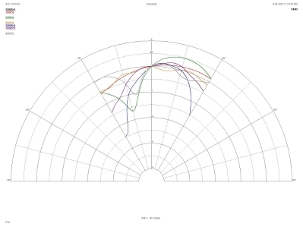 As the frequency increases, however, the relevant lobes are substantially narrowed and it is clear that a correct toe-in is required to take full advantage of SCM19's potential and, also, that listening to the loudspeaker from a short distance is, probably, preferable than to seat deep in the reverberant field. 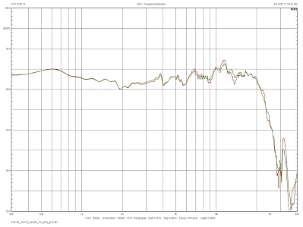 Cumulative Spectral Decay graph, on-axis, quasi-anechoic measurement. Polar response diagrams in the horizontal plane. Frequencies : 1kHz (red curve), 2kHz (green curve), 4kHz (gray curve), 8kHz (orange curve), 16kHz (purple curve) and 20kHz (blue curve ). In the vertical plane, things are even more strict: The SCM19 should be placed on a suitable stand, to locate its axis in the height of the listener's ears (ATC indicates that the acoustic axis passes through the midway between the two drivers centers of the two units and the assertion is verified in practice). 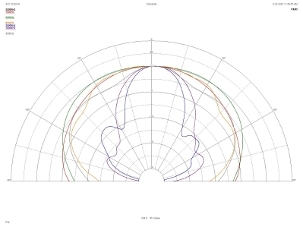 While small deviations towards "down" (i.e the listener seating higher at 10-15°) do not disturb the final result significantly an "upwards" seating position (i.e the listener below the loudspeaker) should be avoided at all costs. As expected, the largest dependence on the listening angle appears for signals near the crossover frequency (2kHz). Finally, both baffle and side panel acceleration measurements do not offer any results that are worth mentioning. 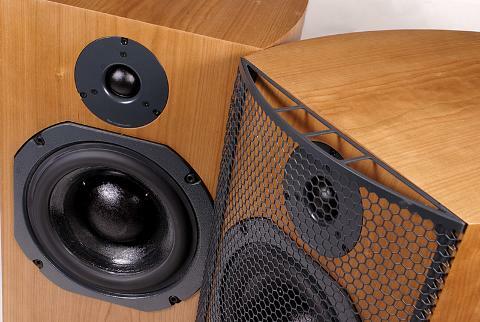 There are some obvious resonances, especially on the side walls, but their levels remain low and are not expected to affect the performance of the loudspeaker in practice. Polar response diagrams in the vertical plane. Frequencies : 1kHz (red curve), 2kHz (green curve), 4kHz (gray curve), 8kHz (orange curve), 16kHz (purple curve) and 20kHz (blue curve ). Positive angles correspond to above-axis measurements. Front baffle (red) and side panel (green) acceleration analysis in the frequency domain. Measurement with the accelerometer positioned near baffle/side panel center.